NAMED BY SOME AS "BLACK FILA". Last November the CAFIB was invited by the Cães e Cia. [Dogs & Co.] magazine to participate in an article which was being drafted and was entitled "The Black Guardians," that actually turned out to be published last month. The idea was that the CAFIB issue its opinion on this coat color, since the so-called "black fila" would be reviewed as a guard dog in that article. It is interesting to be invited to express an opinion on something that we believe does not exist. Objectively, how CAFIB sees it ; the black dog with a pedigree of a Fila, is the result of the predatory and illegal mix-ing that was done for years and initially obtained by crossing a brindle Fila Brasileiro with a black Great Dane. In other words, the infamous "filamarques” [dane-a-fila]. Years later, this kind of crossbred would also be crossed with the black Neapolitan Mastiff. Note that the term more commonly used today for the Great Dane is German Doggue [in Brazil the was known as The Danish Dog and presently known as the German Doggue]. Going one step further: the so-called black fila is the greatest evidence of mixed-ing of all, seeing that anyone can understand color. The harlequin markings, which unfortunately, are also found, albeit rarely in some mixed bred filas, is its rebuttal answer, since those markings are unique to the Great Dane / German Doggue. The issue about not accepting the black fila is not a new one. Suffice it to say, that the extinct Animals & Veterinary Magazine # 25, dated Abril/77, published the first complaints made by Dr. Paulo Santos Cruz, duly incited by me... You can easily access these two letters by clicking on my site http://www.filabrasileirochicopeltier.com.br/7-Cao-Preto-x-Fila-Puro/7-2.jpg and http://www.filabrasileirochicopeltier.com.br/7-Cao-Preto-x-Fila-Puro/7-3.jpg . Note that this occurred 33 years ago, dating to even before the creation of CAFIB. Important commentary: the true History of the Fila is very important for growth and improvement of all new ers. Just as with History in general, it is an inexhaustible source of knowledge and experiences. It should be studied, analyzed, learned and preserved. More importantly, passed on. Precisely my intent when putting together my site: the preservation of the memory of our Fila and its history. (just click http://www.filabrasileirochicopeltier.com.br/index.html ). 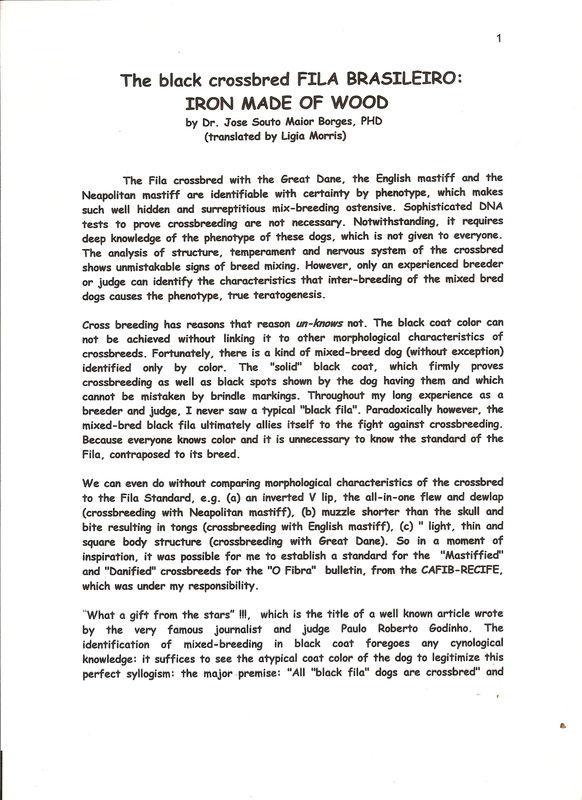 Argument #1: From the beginning, Fila records in Registry books, of the then KCP (Kennel Club Paulista), 1946, to the records from BKC (Brazil Kennel Club) in 1956, a total of only 10 black filas were registered. Of these records, originally 10 specimens had the black color coat variation. In the second half of the 1970’s they re-appear spontaneously and suddenly. My commentary A): In other words, in 10 years - from 1946 to 1956 --- just these few exemplars – which, if by chance would have been true Filas, would have been registered. However, in reality, there weren’t 10, but only 5 registries of black dogs. Five of the dogs listed by Prof. Procopio (that's right, Prof. Procopio’s flagrant 50% error!) included brindles with brown legs and yellow markings, as I alerted him about in a letter dated 24/04/89. This indisputable fact is recorded in these pedigrees which I have copies of, but they were obviously "forgotten" by Prof. Procopio, who was eager to railroad science and genetics in order to get the explanation for the black fila quickly... Thus, in 10 years of records and according to the Procopian thesis, only 0.5 "black filas" were born per year! Assuming they were real filas…More so, according to this "thesis" belonging to Prof. Procopio, from 1956 (most recent date of these 5 pedigrees) up to 1977, inexplicably, there were no records of black filas in the BKC. Therefore, Prof. Procopio wants us to believe that after this huge 21 year gap, by a sleight of hand and all of the sudden, hundreds of black filas, spontaneously and by the grace of CHANCE, started to be born mainly and coincidentally at the KIRIMÁUA kennel, incidentally belonging to Prof. Procopio... Of course these black dogs were quickly and willingly accepted without any questioning or concern about their origin by the directors and other “authoriteh* of the “innocent” BKC / CBKC, which, in turn, obviously had a great increase of its pedigree sales of this new "rarity, type, line and product "... that had been launched to the " Brazilian Canine Market" ... Unfortunately an evil adviser, distant and indifferent, but always demanding its royalties, the lethargic FCI presents itself to seal these new pedigrees. Demonstrating no respect, no monitoring and enforcement of what is to be their own Regulations and Statutes, such as; "Article 2 - Objectives", where it is clearly written down: 1) "Support and promote the ing and use of purebred dogs.." and (2) "protect and maintain the ing of purebred dogs in the FCI countries ..."
One can clearly evaluate that none of these 5 pedigrees have the registered names of 3rd or 4th Gen. relatives, which, incidentally, we should consider as a regular procedure, since the dates of registry of such pedigrees (from 1,949 to 1,956) was thought to be the beginning of Fila registry records in the KCP Brazil and later the BKC. Further weakening this false Procopian theory, these two unique pedigrees which show 2nd Gen. relatives were found repeatedly; totaling 6 times, the name of only two dogs: Diana do Mandaqui and Marajá do Morro Grande. So if they were nothing but Great Dane crossbred or even of genuine Great Danes with un-cropped ears, thus renders even more frustrated this whole fragile Procopian theory. Interestingly, these important details go unnoticed to a doctor accustomed to medical research, perhaps in a desperate desire to "invent" a natural cause for the black coat color in the Fila ... Please note: even after I had formally and expressly warned him by letter in April of 1989. Argument #2: the traditional Fila er from Minas Gerais, Mr. William Frederick Chalmers would have been the owner of the "black fila" called Zulu. My comment: It is not true, as it was found hand-written by Mr. Chalmers on the back of the photo of this dog, annotated: “Mixed bred dog of several s” as uncovered by the Dutch Fila er, Ms. Ines Van Damme, based in Spain. Ms. Van Damme has published two excellent books about our . Therefore, it appears that the dog Zulu, the biggest "poster boy" of Prof. Procopio’s book, is a farce. The "shield" that Prof.. Procopio sought to create leveraged on the integrity, seriousness and history of Mr. Chalmers, the er from Minas Gerais, simply collapsed. (to see on my site, click http://www.filabrasileirochicopeltier.com.br/fila-brasileiro/index.html pages 03, 04-A and 04-B. b) Zulu was not a Fila but, just an ordinary mutt! 1.1. - He had only begun to learn about the Fila, visiting farms in the countryside, and therefore did not feel knowledgeable enough or "...have any technical support to deny purity pertaining to any somatic detail”. 1.2. – He had never brought home a single black dog from the farms, because the very few he had seen appeared to be Great Danes with un-cropped ears, not Filas. 2. Why wasn’t Prof. Procopio do Vale; the Father of the black filas; a re-known, beloved physician and endocrinologist, interested in establishing the legitimacy of the black dogs that were suddenly born without clear explanation in his KIRIMÁUA kennel? Why didn’t Professor Procopio, who had superior medical training, bother to make public, scientific research that he developed in order to recover the black coat color in the Fila, from only 5 dogs and 21 years latter? Why would a scientist not bother to demonstrate and explain his findings, especially in regards to this controversial issue? Why would Prof. Procopio not try to show the genetic research he undertook for the purpose of recovering the black color coat in the Fila? 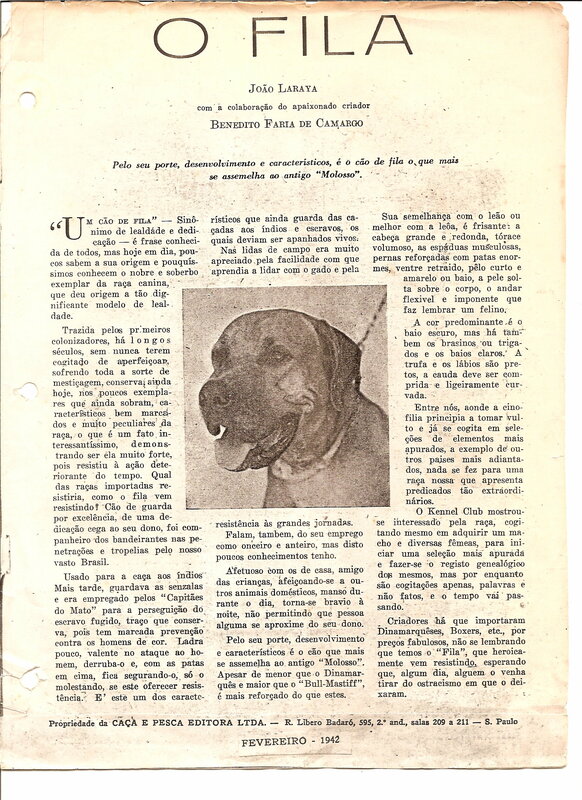 Instead being proud of it, he remained silent, choosing to write a book which shows vague pictures of black dogs which are either always heavy set (Mastino Napolitano) or square shaped and long legged, do not have dewlap and have high tuck (filamarqueses “dana-fila”), as atypical as his dog called Ticão do Kirimauá and which do not prove anything! (to see a photo of this dog click on http://www.filabrasileirochicopeltier.com.br/fotos/1816.jpg ). 3. 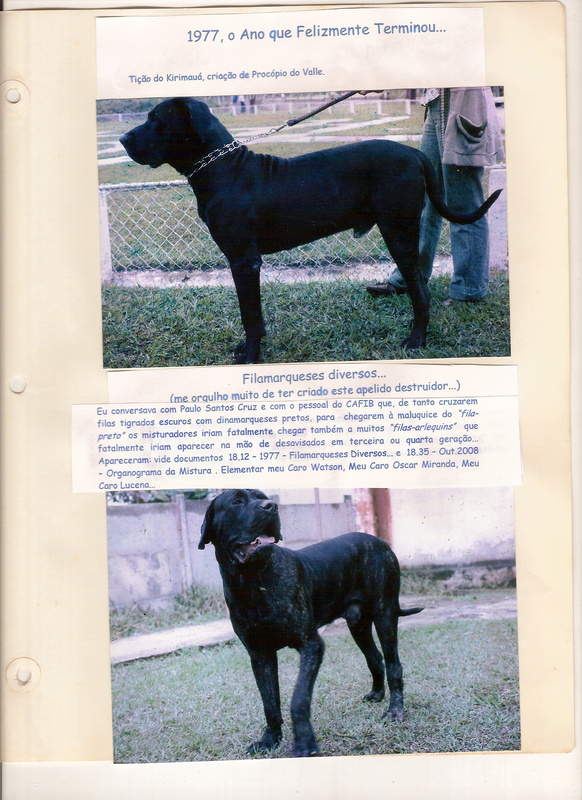 The so-called “black fila” resulting mostly from crossing with black Great Danes are as written by Dr. Paulo Santos Cruz, in 1977: " ... the somatic characteristics related to black [coat color] confirm the illegitimate origin by crossing with the Great Dane: a) elongated type b) a square figure c) long-legged d) narrow chested, and) shoulders dislocated forward, f) lack of fore-chest g) belly tuck h) long neck; i) narrow and long head, but, seen in profile, shows good depth, j) ears small, thin, high set k) tight skin l) weak temperament. Not all gather all these aspects because they were crossed with (pure-bred) Filas, [those characteristics can be found] at a greater or lesser extent, but some of these characters will be present.” Continuing: " ... the coat color is jet black or harlequin." As the only dog in the world with harlequin coat markings is the Great Dane..." we call these dogs filamarqueses.” [dan-a-fila]. n)tired, dull, look often paiting”. Conclusion of above #’s 3 and 4: Dr. Paulo Santos Cruz sharply and indubitably repeats, despite the eternal incognizance of the BKC and the FCI : "... the existence of all or some of these characteristics prove that crossing occurred, because those characteristics could not have appeared in a which does not show them”. 5. Astutely added by Dr. Fernando Zanetti Coeli the er, judge and former President of CAFIB: "The black coat color itself is not indicative of mixed ing, however, it is the clearest indication that it occurred because it always shows itself associated to the typology of s that originate it, which are basically the Great Dane and the Mastino Napolitano (Neapolitan Mastiff)”. 6. There are 22 available documents proving this subject at length on my site (http://www.filabrasileirochicopeltier.com.br/index.html ) under the menu "Black Dog vs. Pure-bred Fila" (http://www.filabrasileirochicopeltier.com.br/7.html ) . 7. We take this opportunity to remind young people who like and respect the History of the Fila; about an event that certainly goes forgotten: the creation the Yandu Consortium [ers association] in 1976. Unfortunately, it was put together in my wonderful city of Rio de Janeiro and which was derived from a homonymous filamarques [dane-a-fila] called Yandu. 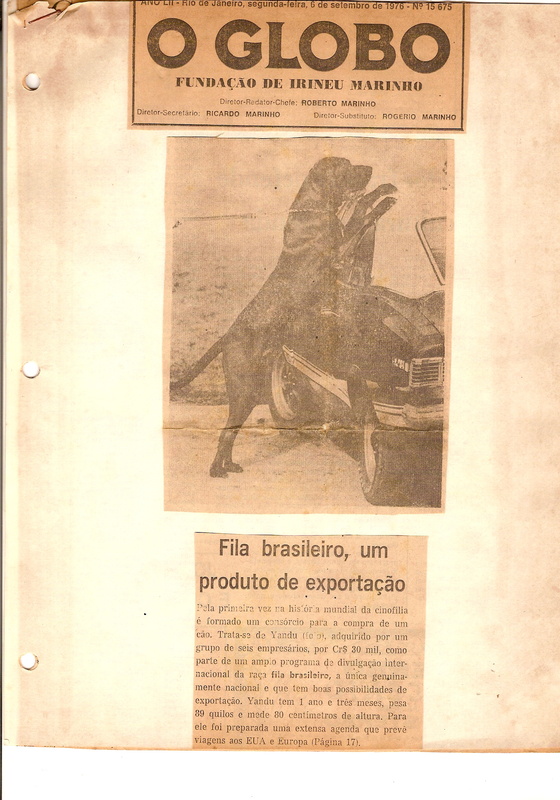 This dog was presented to the Brazilian media as the first "black fila" and even earned front page photo and article in one of the leading newspapers of our country “O Globo”: (http://www.filabrasileirochicopeltier.com.br/7-Cao-Preto-x-Fila-Puro/fila-brasileiro-E.jpg and http://www.filabrasileirochicopeltier.com.br/7-Cao-Preto-x-Fila-Puro/fila-brasileiro-F.jpg ) The Consortium wanted to make it into an exceptional reproducer, having its offspring sold to several countries. Fortunately and in time, they were made aware by me that Yandu was a fraud. It was nothing more than a half-, a crossbred of the Fila with a black Great Dane. Because this group of entrepreneurs from Rio de Janeiro was serious and honest, chose to extinguish this Consortium but took a big financial loss. That's right my friends: 33 years ago this filamarques this "black fila" was rejected. 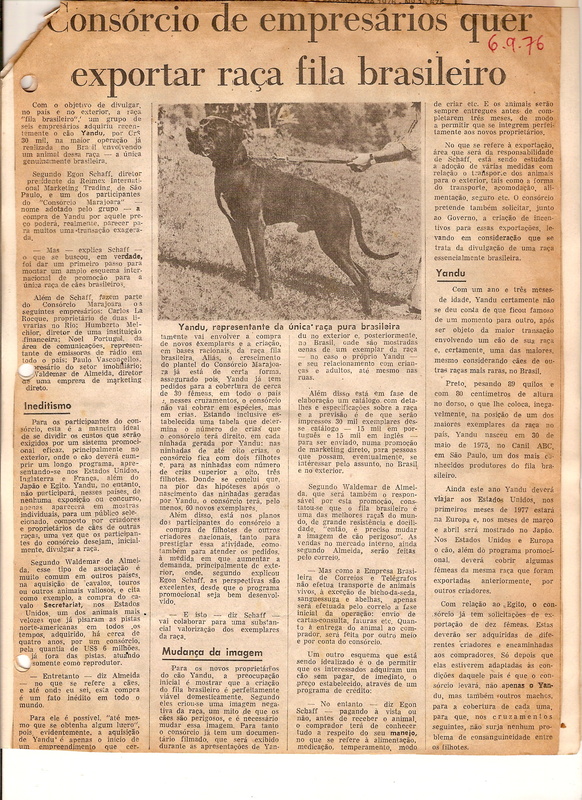 ( http://www.filabrasileirochicopeltier.com.br/8-Documentos-de-1978/8-21-A.jpg ), black dogs with Fila CBKC / FCI pedigree began to appear, only now with clear signs of cross ing with the black Great Dane and more importantly, without any plausible explanation for this fact. That is, I believe that the "filamarques" took a "ride" on the wave of cross ing that had arisen from these crosses between the Fila and the English Mastiff. In my opinion, this was in effect, the actual "great genetic research” performed. Conclusion B: the advocates of black coat color still cling desperately to the fact that Dr. Paulo Santos Cruz had written 60 years ago: "Whomever wants to color should cultivate roses." However, these same apologists appear to have very short memory, since it was written in the same exact article (see the book "The Dog, Our Best Friend" by Luiz Hermanny Son, pp. 435) and only one sentence before that, Dr. Paulo Santos Cruz has also drafted as exception "For now the goal should be: QUALITY”. A revealing and instructive sentence. Unfortunately, biased advocates of the black coat color insist on "forgetting it" and deceive the naïve and new buyers... Accordingly, any enlightened person of good faith, can only understand only that; at that moment the Master er of CAFIB made a exception to the black coat color, since he was not concerned with color but with the establishment of the typical characteristics of the Fila. He was concerned with the preservation of quality in those rustic and loyal dogs, called by the Farmers/Land Owners of Minas Gerais as Jaguar-dogs, Cattle-dogs, and “Big-Headed” dogs. He was interested in perpetuating that Brazilian dog he recently had discovered and that guards were unsurpassed estate guardians. A quality that was what Dr. Paulo Santos Cruz was looking for in other s and had not found, after having his home in the city of Santos-SP invaded by a group of boys who were chasing after a hot air balloon during St. John’s feast ... (Click: http://www.filabrasileirochicopeltier.com.br/4-Documentos-de-1975-e-1976/4-17.jpg and http://www.filabrasileirochicopeltier.com.br/9-Documentos-ate-1979/9-3.jpg). Dr. Paulo’s interests where in bringing excellent exemplars from the farms of Minas Gerais and Sao Paulo to his home in Santos and to give his friends exemplars of those great national canines. Dr. Paulo was right and thanks to him we have inherited the Fila. Thanks to him the first export of Filas to the German Royal Family was made possible in 1954. Thanks to him we are here today talking about the Fila and its History must also be preserved. Finally, thanks to CAFIB, its directors and associates, despite all the neglect from BKC / CBKC / FCI, our dear Fila Brasileiro was saved from extinction! Seeing that the advocates of black coat color are so fond of articles like this one of Dr. Paulo’s, we will continue from this same source of research... Despite the fact that some recent ers do not care about the History of the Fila; its preservation and also its great usefulness as an inexhaustible source of experiences and knowledge, fortunately we have in our country men like Paulo Roberto Godinho. For some decades, I have affectionately named him "The Living Encyclopedia”. Paulo Godinho knows "almost" everything and was one of the biggest winners of Quiz Shows, in this country, that are still a huge success on television around the world. But that is another rant .. Unfortunately, the board of director’s of CBKC/FCI, pride will not let us benefit from "the cup of wisdom" ... Why do I affirm this? Very simple: commenting with Paulo Godinho on this article of mine, he immediately reminded me. - "The color of the FIla? Its right there in your site Chico, right there! It’s in the first article ever published about the Fila entitled "The Fila". It was published in the "Caça e Pesca" magazine ("Hunting and Fishing" magazine) February, 1942, written by John Laraya, in collaboration with the er Benedicto Faria de Camargo. Indeed, this pioneering article on my site is available under "Documents up to 1974”. It also substantiates how fundamental historical knowledge is. Do you have any idea what the early ers and historians of the Fila wrote? Here it goes: "The predominant color (of the Fila) is the dark Baio [fawn], but there are also Brasina (according to the Concise Oxford dictionary = that has red hair [as in burning coals], or brindle (with some black stripes or almost black stripes) and light Baio [fawn]." 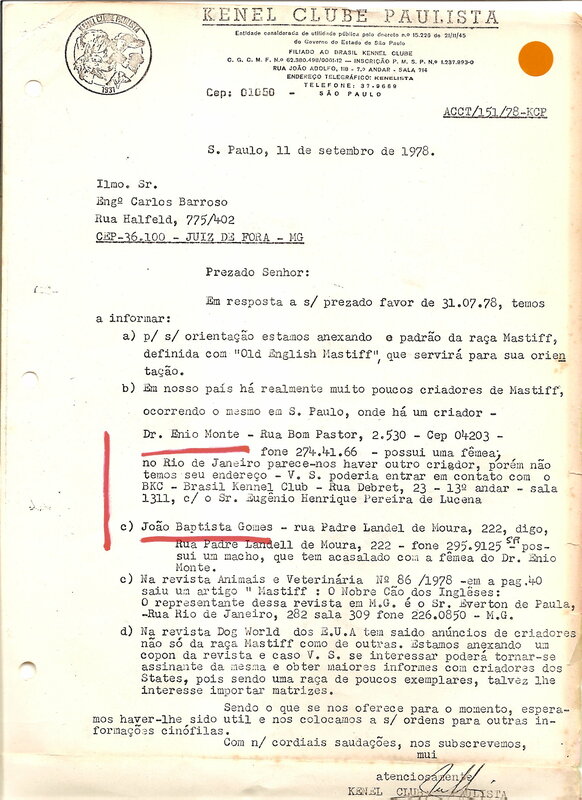 I first heard of Dr. Paulo Santos Cruz in mid-1970, during a meeting I had with the judge and former Fila er Zito Hermanny (Kennel Amazonas) whose grandfather, owner of the Kennel Guararema (http://www.filabrasileirochicopeltier.com.br/3-Documentos-ate-1974/3-3.jpg ) , was one of the precursors of the Fila in Rio de Janeiro. After a few telephone conversations with Dr. Paulo, I went to Santos to meet with him. He had become bored and tired of dog world politics and had self-exiled to Santos; distanced himself, ing few liters of Filas in his once unbeatable Parnapuan Kennel. From that moment on we had weekly phone conversations, even when I was working in New York and then in London (1976, 1978 and 79). Contact between us was permanent. I came to know "my dear old" Paulo intensively. For that reason, I say that his democratic and generous open-mindedness; never castrating nor creator of obstacles, is what made him not give a damn about the black color coat, and left it forgotten within the other color coat descriptions in the original Standard. He neglected it, since in effect, there were no black dogs with the Fila phenotype and yes, only Great Dane mixed-bred dogs. Especially because nobody in their right mind would suggest the most unlikely event; that decades later a doctor would try to invent a dog with this color coat, taking advantage of a loophole in the standard. However, friends, I understand that science evolves ever more rapidly, especially with the development and ongoing support of information technology. The best prospect is that soon the markers of nuclear DNA and mitochondrial DNA will make much easier to prove and separation of mixed-bred dogs with CBKC / FCI Fila pedigree, from purebred Filas with no pedigree or those having a CAFIB pedigree and a CBKC/FCI pedigree as the Ph.D research done by the er and veterinarian Dr. Anibal Felipe-Silva, which is underway. http://www.filabrasileirochicopeltier.com.br/17-INGLES-FILA-BRASILEIRO/17-a.jpg and the 3 subsequent pages). Exquisit..
3. But if you disagree with my view points above and you’re are happy with your black dog, if you believe it is a pure-bred Fila, since it has a fila pedigree and has won several CBKC / FCI medals and awards, go ahead and good luck! 4. But keep your eyes open: the black dog, repeatedly named by some as the "black-fila" with the CBKC / FCI pedigree, is going out of fashion. - “Fila” with capital “F” = true Fila. But “fila” with small “f” = mestizo, mongrel, cross dog. Airton Campbell, Anibal Felipe-Silva, Carlos do Amaral Cintra Filho, Fernando Zanetti Coeli, Ines Van Damme, José Souto Maior Borges, Ligia Morris, Paulo Godinho.